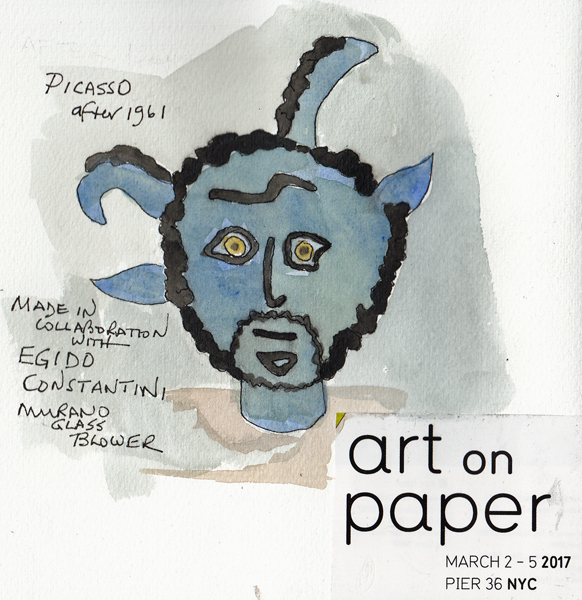 "Art on Paper" at Pier 36 in Manhattan: Each year my husband and I visit the annual Art on Paper exhibit on Pier 36 and then walk back through the Lower Eastside to lunch in Little Italy. 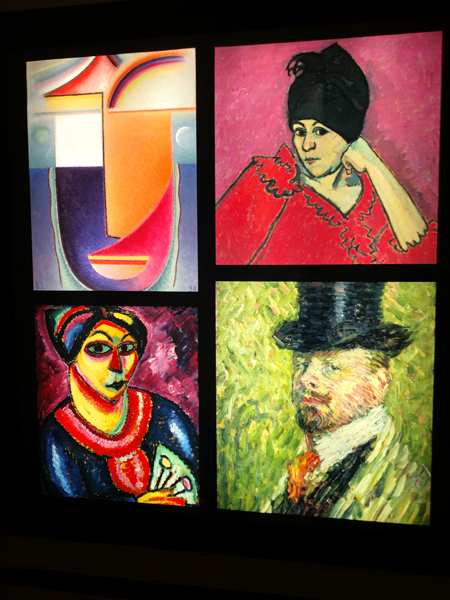 I never saw a Picasso blown glass piece before (not on paper I know, but with some Picasso drawings in one booth). The Gallery owner assured me that it was a piece made in collaboration with Egido Constantini, a Murano glassblower. Think of it as an upside down globe. New York Philharmonic Young Peoples' Concert: We take grandchildren to the New York Philharmonic Young People's Concerts 4 times each year. 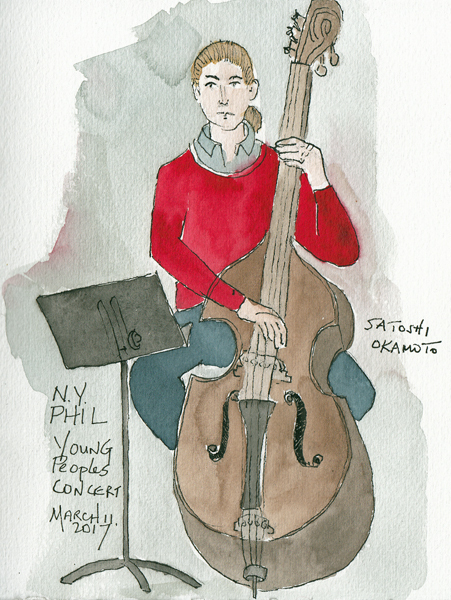 Before the main concert, there is always a short concert for Young Composers (an NYC program in the schools) to have their work played by Philharmonic musicians, and I sat right in front of the bass player. "Central Park Sketching and Art Meetup Group" Yesterday was the 10th Anniversary of the Central Park Sketching and Art Meetup Group and we had a big party at the Manhattan Ballroom - during which we put together still life arrangements, from objects brought by group members, and sketched, painted, and ate! Congratualiations Jesse Richards. You're a great Meetup leader! In spite of our Tuesday snowstorm, both Battery Park City and Fashion Institute of Technology (FIT) sessions were open on Wednesday. I put on many layers and snow boots, and went downtown to draw. I was so happy I did. 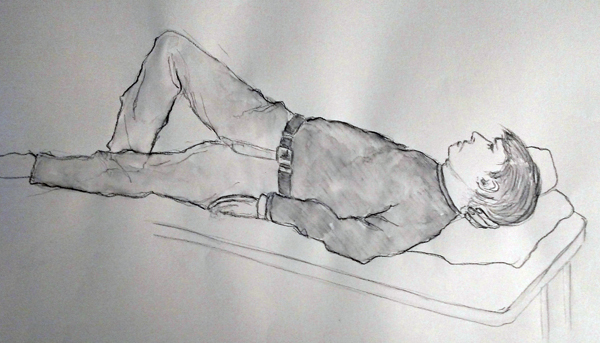 Here are 3 of my drawings of David, our model at Battery Park City. 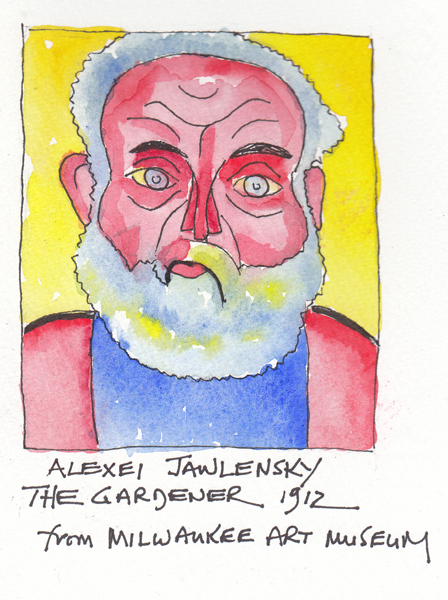 They were all drawn with soluble graphite and then either painted with clear water or watercolor paint. 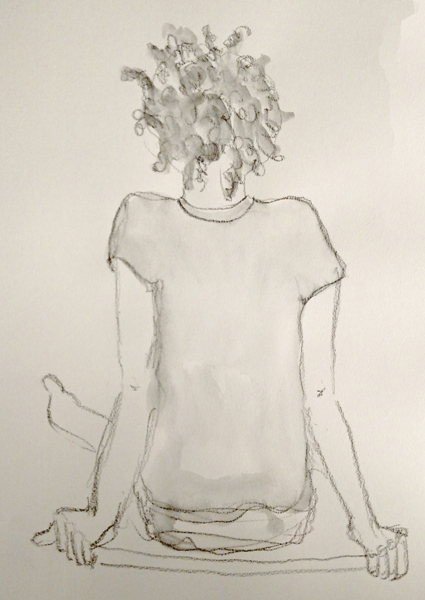 20 Minute Model Pose: Drawn with General's Sketch and Wash soluble graphite pencil and painted with clear water. I have never enjoyed drawing with charcoal, maybe because it is so messy. But I love master drawings done with charcoal. Wish I could make the leap! So for now I continue to draw with the soluble graphite pencils. 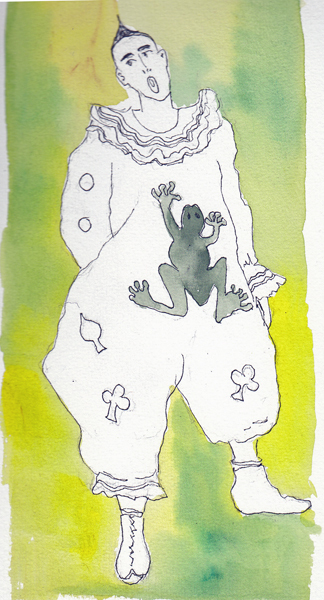 We had a model dressed in costume at my evening FIT Illustration class. We made quick drawings of her 20 minute pose and then painted her and a background during several more 20 minute poses. 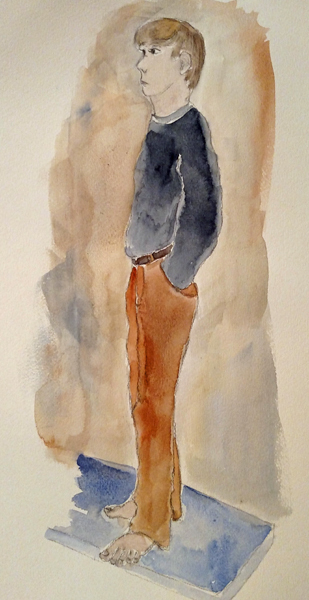 I am really enjoying the emphasis placed on the use of watercolor in this class and look forward to the new assignment when we arrive each week. This is Asia Week in New York City - when museums, galleries, and auction houses focus on Asian Art. Several years ago my friend Pat and I discovered the Asian Modern and Contemporary Auctiuon Preview at Sothebys and we look forward every year to visiting some of our now favorite artists. One of them is B. Prabha and her two paintings this year did not disappoint us. 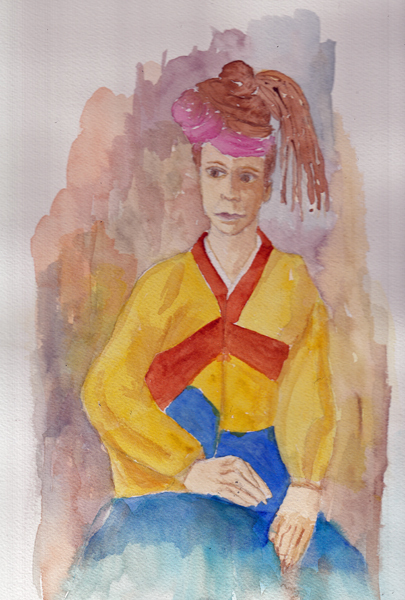 This was my watercolor copy of one of her oil paintings - drawn at the preview and painted at home. 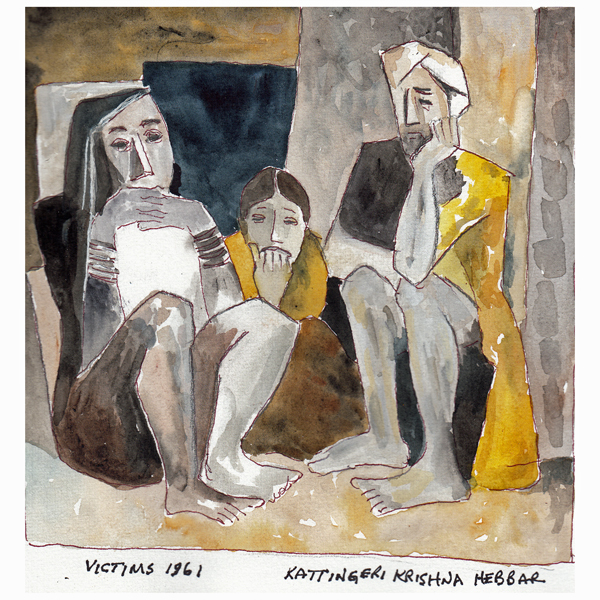 I also fell in love with "The Victims" by Kattingeri Krishna Hebbar, and I wrestled with drawing it from the rectangular image onto the page in my square sketchbook. But I wanted the experience of putting this beautiful painting into my muscle memory, and tried to convert oil into watercolor when I had time at home. This is my photo of the original Hebbar painting. Hope you like it as much as we did. Pat, Benedicte, and I were sketching in different parts of the exhibit when a Sotheby's employee stopped to talk to me while I was sketching. 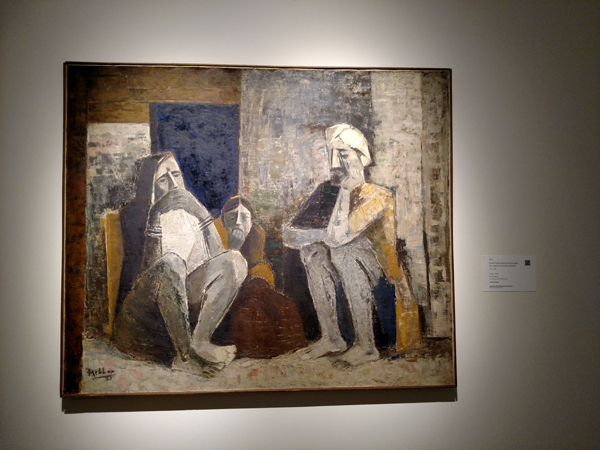 I told her we came to see the auction preview each year and have favorite artists - Naguib Mahfouz, M.F. Husain, and B. Prabha among them. She said that they were artists who didn't become abstract expressionists, and remained true to their figurative paintings. During February and March I spend Wednesday afternoon at Figure Drawing in Battery Park City, with multiple 2, 5, 10, and 20 minute poses. These are two of my drawings of Marilyn from yesterday. They were drawn with a General Sketch and Wash pencil of soluble graphite, and then "painted" with clear water. I was thrilled that I had two great hands to sketch, and I'm trying so hard to improve these skills. After supper at Hudson Eats in Brookfield Center, I move uptown to FIT for my Watercolor Comps Class. Last week we used a full palette, and tried to use pale and intense colors for a vase of sunflowers- reviewing how to control pigment and water. 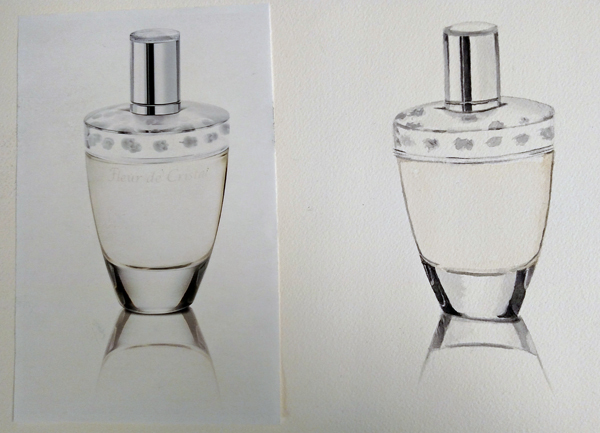 This week, our challenge was to significantly increase the amount of water we used, still controlling it, while painting a copy of a commercial perfume bottle photo. We talk lots about illustrations and commissions during the evening and I love the studio time. Photo left, my painting on the right.